Active Media announced ZIF SSD upgrade kits for Apple's MacBook Air and other laptops. Available in 64GB, 128GB and 256GB capacities, these disks will retail in the US for around $169, $289 and $739. 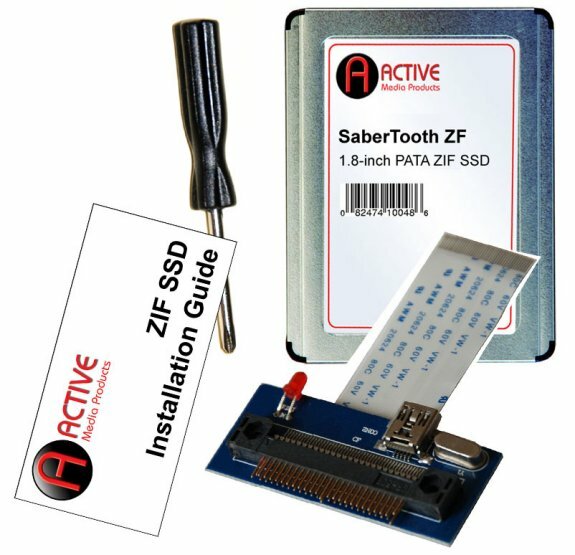 Active Media Products, a leading manufacturer of SSDs and DOMs, today announced three new ZIF SSD upgrade kits for the first generation MacBook Air, most Sony Vaio models and other popular laptops that include a ZIF SSD, a cloning device, a mini screwdriver and an illustrated installation booklet. AMP's cloning adapter enables customers to quickly clone their existing ZIF drive onto the new ZIF drive through a USB port. "Our cloning adapter will help customers get up and running that much faster because now they don't need to reinstall the OS and all their applications. We included a detailed installation guide and a mini screwdriver in the box to simplify the upgrade process," stated Active Media Products VP of Sales, Jerry Thomson. AMP does not include a USB cable or cloning software in these kits. The Sabertooth ZF ZIF SSD is a turbo speed ZIF SSD that delivers transfer speeds up to 130MB/sec. With no moving parts, the ZF is faster, lighter, quieter and more rugged than ZIF hard disk drives.